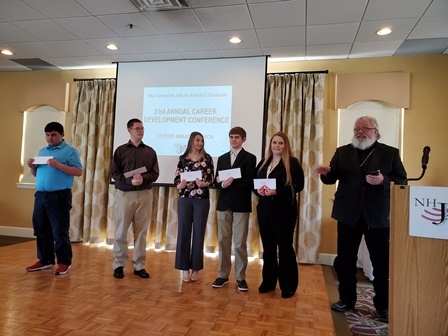 On April 2nd 55 NH JAG students attended the 31st Annual Career Development Conference at the Derryfield Restaurant in Manchester. The conference and awards luncheon is the culmination of competitive events the students have taken part in for several months. The events included interviewing competitions, public speaking and community service project presentations. We were pleased to have Randy Pierce—founder of the charitable organization 2020 Vision Quest,entrepreneur, adventurer and philanthropist—share his story with us. Randy is totally blind. Always embodying the 2020 Vision Quest theme of “Achieve a Vision Beyond Your Sight,” he has continually forged ahead to experience an amazing variety of adventures and accomplishments such as, winning a National Marathon Championship, run in four consecutive Boston Marathons; has summited Mt. Kilimanjaro in Tanzania, Machu Picchu in Peru, all 48 of the New Hampshire White Mountains’ 4,000-footers twice and has competed in three Tough Mudder events. Eight students representing various high schools and out-of-school programs throughout the state were honored for their outstanding leadership qualities. Students were selected by faculty at each of their schools for best exemplifying true leadership skills. Susan Huard, Chair of the NH JAG Board, presented each honoree with a plaque. One of the highlights of the annual event was the presentation of academic scholarships by Bishop Jason Sanderson. 10 students received scholarships toward their post-secondary education from the Jason Sanderson/Bobby Stephen Scholarship Fund. Thank you to all the special guests who attended the CDC and all who support the NH JAG program! And a special thank you to the many judges who volunteered their time to rate the individual events. Those were the powerful words of Steven Santiago, who participated in the New Hampshire Jobs for America’s Graduates (NH-JAG) program at Manchester High School West and went on to graduate from the University of New Hampshire with a Bachelor’s Degree in Environmental Engineering. Santiago was honored at the NH-JAG 13th Annual Leadership Awards Event at the Grappone Conference Center in Concord Tuesday morning. He was in good company. Also honored at the event were Congressman Chris Pappas, the Manchester School District and Dr. Bolgen Vargas, Superintendent, for their leadership and commitment to improving the lives of NH youth. AT & T was also recognized for its generous contributions that have made it possible for many New Hampshire young men and women to recognize the value of their education and pursue rewarding careers. “Working together and looking out for each other, we can ensure that more New Hampshire students can fully participate in our state’s educational opportunities and economic success,” said Congressman Pappas in accepting his award. For 31 years, NH JAG has successfully served over 18,000 young people and last year attained a 100% graduation rate among its participating students. The statewide program facilitates learning, skill development and community involvement, empowering these young adults to identify their goals and to define and follow a productive path within which to achieve those goals. Sponsors for this year’s Leadership Event included Hannaford, the Walmart Distribution Center, Eversource, Manchester Community College, The Rowley Agency and Northeast Delta Dental. Manchester School District Superintendent Dr. Bolgen Vargas (left) was congratulated Tuesday on his New Hampshire Jobs for America’s Graduates (NH-JAG) Leadership Award by NH Department of Education Commissioner Frank Edelblut (right). Dr. Susan Huard, New Hampshire Jobs for America’s Graduates (NH-JAG) Board Chair (left), Tuesday presented Congressman Chris Pappas (right) with a NH-JAG Leadership Award for his commitment to improving the lives of NH youth. Manchester School of Technology (MST) Student Alexandria Ismael, NH-JAG Specialist Brandon Doyle, MST Principal Karen Machado, MST student Gabriella Cuelho, MST student Elizabeth Shepherd and NH Department of Education Commissioner Frank Edelblut (l-r) celebrated the Manchester School District’s NH-JAG Leadership Award on Tuesday. The New Hampshire Jobs for America’s Graduates program (NH-JAG) and the Appalachian Mountain Club (AMC) had another successful season of trail stewardship and hands-on job skill development with Berlin and Woodsville High Schools. This year, ten students from Berlin and five from Woodsville completed meaningful trail work with local and federal partners. Through their excellent work on these lands, NH-JAG students learned and practiced practical job skills and positive work habits. Additionally, these students gained awareness of career opportunities in the trades, and in outdoor resource management and recreation. Students from each high school worked four weeks under the supervision of AMC trail crew leaders Becca McNeeley and Ben Chase. The AMC crew leaders always bring a special dedication to their work with the NH-JAG students, and Ben and Becca were no exception. Throughout this report you will see quoted the “Work Habits of Exceptional Employees” that Ben and Becca crafted and delivered throughout the season. This program maintains its strong track record of youth engagement and job skills development thanks to support from the Caswell Family Foundation, New Hampshire Charitable Foundation and Tillotson Fund. MANCHESTER, NH – When New Hampshire Governor Chris Sununu today recognized New Hampshire Jobs for America’s Graduates (NH-JAG) for its growth and outstanding student outcomes, he was not just talking numbers. He was talking people. While NH-JAG surpassing five of five performance outcomes, including achieving a 100% graduation rate for the Class of 2017, is extremely impressive, it is the youth behind those numbers that represent the true success, according to the Governor. Joe Rodger participated in the JAG program at Woodsville High School (WHS) and by the time he graduated from WHS, he was already serving as a firefighter in the towns of Bath and Monroe. He entered Lakes Region Community College and recently graduated with a dual degree in Fire Science and Fire Protection. He plans to further his education. Juliette Gonzalez participated in the JAG program at Manchester West High School and went on to obtain her LNA before attending Southern New Hampshire University to study healthcare administration. She is currently employed at Catholic Medical Center and plans to return to school in the future to obtain her Master of Public Health degree. “This program is making a real difference in the lives of so many New Hampshire youth, not only in school, but in work and life,” said Governor Sununu, in presenting NH-JAG with the “5 of 5” Award for its growth and outstanding student outcomes alongside Jobs for America’s Graduates President & CEO Ken Smith. The award is the highest National Performance Award from Jobs for America’s Graduates. NH-JAG has earned the “5 of 5” Award for 12 consecutive years and has successfully served over 17,000 young people. 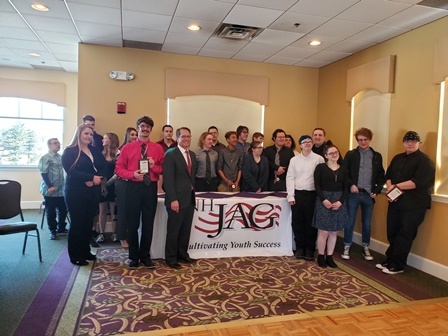 NH-JAG surpassed established goals in each of five categories, with the Class of 2017 having a 100% graduation rate, a 92% positive outcomes rate, an 81% employment rate, an 87% full-time jobs rate and a 97% full-time placement rate. During the 2017-18 program year alone, NH-JAG served 190 youth in five high schools – Berlin High School, Manchester Memorial High School, Raymond High School, Winnacunnet High School and Woodsville High School – and 60 out of school participants at two locations in Claremont and Concord. The goal is to serve even more students moving forward, with the support of public-private partnerships. NH-JAG Executive Director Janet Arnett was pleased to announce the addition of four new schools to the program this year – Laconia High School, Littleton High School, Manchester School of Technology and Newport High School. “With new funding from the New Hampshire Department of Health and Human Services and the AT&T Foundation, we are able to expand to 11 programs this year and create new initiatives in project based learning,” said Arnett. The significant grant provided by AT & T to help grow the program is in keeping with its Aspire Program, which brings together AT&T employees, nonprofits and community members to help equip students with the skills they need to lead the digital, global economy. Manchester Superintendent of Schools Dr. Bolgen Vargas is thrilled that NH-JAG will be in another Manchester location. “We are proud that the Manchester School of Technology is New Hampshire-JAG’s newest program site. The mission of NH-JAG aligns with our school district’s goals to prepare students to become career and college ready. At MST, students have direct access to their futures through Career Technical Education opportunities. NH-JAG is a valuable liaison for students as they venture into the world,” he said. Governor Sununu, a member of the Jobs for America’s Graduates Board of Directors, would like to see NH-JAG serving even more students, and hopes public-private partnerships will be the mechanism to make this happen. “By working together, we can best leverage dollars to provide students with knowledge and hands on experience in the workforce to help young men and women in New Hampshire stay in school, graduate and go on to succeed in life and become valued citizens,” he said.